Fizzle arrived here as a very confused baby of about 6 – 7 weeks old. 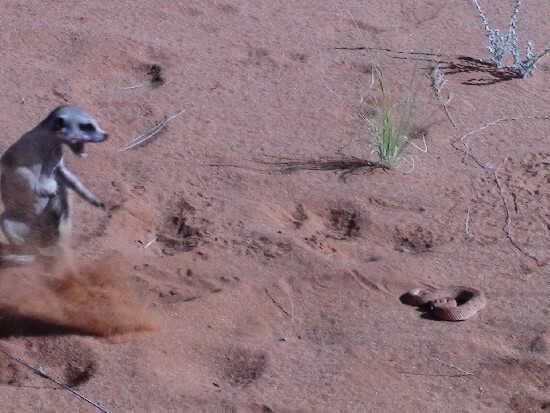 He had been bought by a lady in Upington that thought she was buying a baby Ground squirrel, not a mongoose, and had fed him on a vegetarian diet. However, he took to insects in a flash and never looked back. He was a sunny personality and just loved people, especially children. He would go for walks with anyone that he saw walking and this sometimes led him into trouble because he got lost, once for almost a week. His favourite trick was to stand on his hindlegs on peoples’ shoulders from which he would ’guard’ against predators. His nemesis appeared one morning at the campsite when he was about 6 months old in the form of a little wild female that came out of the veldt and was determined to lure him away. I called her Jezebel. She offered herself for mating and although Fizzle was rather naïve in other respects, he knew exactly what to do in this case. Over the ensuing week she came progressively closer to the house until she was sitting waiting for him on the stoep in the morning. Then he started to spend, first one night away, then two or three until he was gone for up to a week or more. Then it was a month, after which he arrived with a very pregnant Jezebel and her brother, stayed overnight and then disappeared once more. This time he was gone for 6 weeks and returned almost skin and bone, badly bitten, his tail and one paw broken. It looked as if he had been grabbed by some predator, maybe a Wildcat from the size of the bites, but had managed to limp back. I fed him up on chicken and insects, doctored his wounds and once he was his old self again, he started calling for Jezebel once more. She turned up with her brother and two babies in tow and Fizzle disappeared with them again. I had pretty much given him up for dead or firmly in Jezebel’s clutches when, after an absence of nearly 3 months, he turned up once more, his broken tail still not healed but quite fit and chirpy. As Fate would have it, it was Xmas Eve and he stayed with me until New Year’s Day, making the acquaintance of Poppet, still a baby, in whom he was not in the least interested. She, however, stuck to him like glue. New Year’s Day dawned overcast and Fizzle sat outside calling loudly the “Where are you?” call, obviously trying to contact Jezebel. 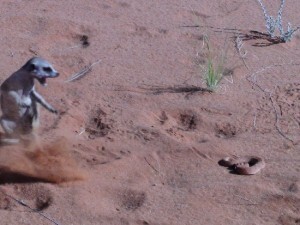 He then set off at a fast lope, Poppet running behind him to my horror, and disappeared over the dune with her. This was the last I saw of him and I hope he is with his little family still.